Agah Bahari was born on July 3, 1983 in Tehran, Iran. He started studying music at the age of seven, playing the recorder flute and xylophone. When he was ten, he moved on to the classical guitar (nylon string), but soon gave it up in favor of playing the keyboard which he played for four years. When he was fourteen, he picked up an electric guitar for the first time and hasn’t put it down since! At the time, he loved Metallica, Megadeth, Pantera and few other speed/thrash metal bands, and played rhythm guitar in this style for four years. By 2002, he was ready to play five sold-out performances for more than 1,000 people at the Tehran Art University with the band Exir. Couple of months later, he was accepted to attend the Berklee College of Music, placed in Boston, MA, which never happened as his student visa request was rejected. called "Depression: A Multimedia Project" at the Tehran art gallery Tarrahan Azad. In the Fall of 2004, he was invited to join the band Meera who had released their first album in both Iran and Australia. Agah performed guitar, songwriting and composing duties with the band, and recorded three new songs with them, one of which he wrote. Dominic Miller. He returned home to Iran and re-joined the band Meera, playing four sold-out shows. After another live performance at the Taraneh Music Institute in Tehran, he began to write and record his own music. In June of 2006, the first song, "Revolving Universe", was recordedwith members of Planet X, Derek Sherinian on keyboards, Virgil Donati on drums and Rufus Philpot on bass. The Planet X members recorded their parts in Hollywood and then added Agah’s guitar tracks,which was recorded in Tehran. In Oct of 2006, the iranian ministry of culture announced that Agah has been officialy banned for having any performance and/or recording in Iran since 2003.Soon after, in Oct.11.2006, Agah has left Tehran, Iran to Toronto, Canada. 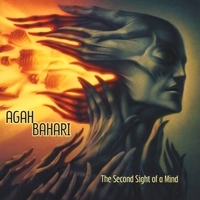 In Jan.08.2006, Agah re-started working on his first solo album with the keyboard virtuoso Derek Sherinian, as well as other legendary names in Prog/Fusion music, Virgil Donati and Ric Fierabracci. "Agah Bahari is writing cutting edge instrumental progressive rock.